Lahore has been subject to many different ruling dynasties over the centuries but it came to prominence under the Mughals after Babar defeated the Sultan of Delhi, Ibrahim Shah Lodi, at Panipat in 1526. As the capital city of Emperor Akbar from 1584 to 1598, Lahore saw the construction of some of the finest monuments in the Mughal Empire. The Golden or Sunehri Mosque is located in the old city of Lahore and was built in 1753 by Bikhari Khan, who was Deputy Governor of Lahore. 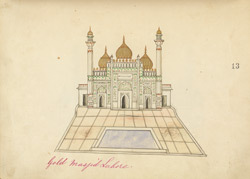 It rests on a raised plinth and is named after its three gilded domes and gold topped minarets that are 10 metres high.